Then I read “Getting Things Done: The Art of Stress-Free Productivity” by David Allen and I realized there was a link between my lack of organization and my anxiety. That’s a terrific summary. I wasn't going to write about GTD because it isn’t specifically about writing. Then I thought: Why not? If I’ve benefited from it, perhaps (if you aren't already using it) you will too. Besides, writing a book IS a project—and a pretty complex one at that. I've found Allen's principles of natural program design have helped me clarify my goals for my books. I'll talk more about that, below. I know from personal experience that anxiety has many different causes. I’m not saying that folks with anxiety are poorly organized or that if a person with anxiety becomes better organized their anxiety will go away. BUT to the extent that anxiety is caused by a feeling of loss of control over the disparate bits of one’s life, then ... yes. I think that becoming more organized could help to lessen one’s anxiety. But who knows. All I can say for sure is that it lessened mine. The Capture step is something I’ve been doing for a while and chances are you have been too—jotting down ideas or reminders on whatever is at hand, be that a piece of paper, a stray grocery receipt, a notebook or writing journal. What you use to record your ideas/reminders doesn’t matter. Any of the above would do, the key thing is that you must be confident you won’t lose it. I keep a notepad in my purse and another on my office desk. While I’ve found it easy to lose loose pieces of paper it’s a bit more difficult to lose an entire notebook! In any case, at the beginning of every day I go through my journal and sift through all the tasks, ideas and ToDo items from the day before. For each item you’ve recorded ask, Is it actionable? If yes --> Decide what action should be taken. If that action will take less than, say, two minutes do it right then. If the action would require more than two minutes then delegate it to someone else or put it on a list to do later. If no --> Discard it, incubate it (look at it again at some later date) or file it for reference. At this point you’ll have a list of tasks that require more than two minutes. If (which is unlikely) you only have 20 or 30 of them then you might want to skip this step. If not, organize the tasks into lists however makes most sense to you. For example, I’ve broken my tasks up into a general list (Reminders), a WIP list (To Write), a TBR list (To Read), a TBR wish list of books I want to read one day but know I won’t have time in the foreseeable future (To Read One Day). I also have a list of stories matched with projected publishing dates (To Publish). I’ve embedded a link into this list, a link that opens up a Google Doc that has a record of all my published works (the title, when I published them, under what name, etc). When I discovered how few movies I’ve watched lately I added a list for movies I haven’t seen but want to (movies 2014 & 2015). I also have one for TV Shows (I’m looking forward to season two of True Detective!). Since you’ll be reviewing all these lists once a week, only record tasks you really do want accomplished. Otherwise the system will become bloated and, eventually, break down. As the folks at Nike say: Just do it. Go through your lists and do what needs to be done. You’ve probably seen lists like this before—likely on this very blog! But here are three questions, questions David Allen raises in his book, that I like to apply to my WIP, especially if I’m stuck. a) What is the purpose of this project/book? To show that, no matter the odds, no matter what is stacked against you, you can make it through. You can succeed. You are stronger than you think. b) What would a successful project/book would look like? - It would be a manuscript of between 70,000 and 100,000 words with, among other things, one main overarching theme and goal. - It would be immediately recognizable from the first few paragraphs as urban fantasy. - The protagonist would be introduced on the first page and in such a way that her essential personality, her strengths and weaknesses, are communicated clearly. If I’m having trouble with a manuscript I like to break it up into units made up of scenes and sequels. These units could be chapters or just elements of chapters. If you want to keep your lists in your computer there are many choices available. One of the wonderful things about this method is that you can use whatever software works for you. A lot of folks swear by Evernote. Until recently I used two apps that came with my iMac: Reminders and Calendar. Now I use Fantastical 2 and absolutely love it. I’m curious. 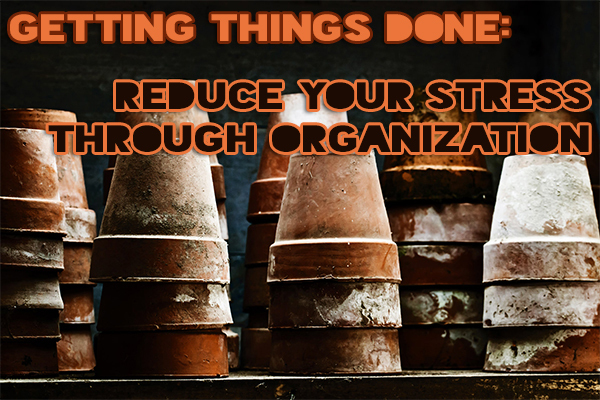 What do you use to help organize your life? Are you old school and eschew everything but pen and paper or do you use one (or more) software programs? 1. “David Allen on How to Fix Your Life,” by James Fallows in The Atlantic. 2. “Productivity 101: A Primer to the Getting Things Done (GTD) Philosophy,” by Alan Henry in Lifehacker.com.